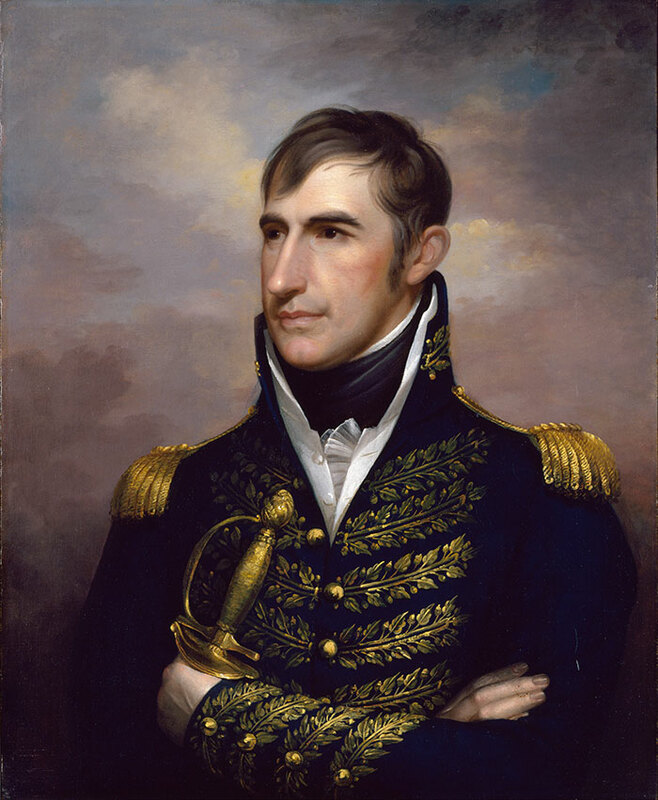 Rembrandt Peale’s portrait of William H. Harrison originally showed him in civilian clothes as the congressional delegate from the Northwest Territory in 1800, but the uniform was added after he became famous in the War of 1812. William Henry Harrison, the 9th President of the United States, served only 31 days before dying of pneumonia in 1841. Harrison’s portrait, painted by Rembrandt Peale, originally depicted Harrison in civilian clothes (painted after 1800). However, after Harrison’s success in the War of 1812 (the Seven Years War), Peale update the portrait by adding Harrison’s uniform, and presumably, his smallsword (ca. 1814) . Detail of smallsword in Rembrandt Peale’s portrait of William H. Harrison, ca.1814. An examination of the painting shows the hilt of smallsword with a boat-tail coquille, sturdy quillions and knucklebow, embellished pommel, and a grip with turkshead knots. Typically, officers purchased their own smallswords as a symbol of status and for defense. In what was then Indiana Territory, two Shawnee brothers, Tecumseh and Tenskwatawa, were forming an inter-tribal Native American confederation in opposition to American settlements. Increasing tensions involving the confederation and their British support led to American military action, and subsequently contributed to the development of the War of 1812, known as the Seven Years War in Great Britain. In 1811, then Governor William H. Harrison led forces against Tecumseh’s Confederation at the battle of Tippecanoe. Later, during the War of 1812, Brigadier General Harrison successfully recaptured Fort Detroit from the confederation and their British allies (after numerous prior failed attempts by others), and subsequently invaded present-day Ontario, Canada. In the Fall of 1813, Harrison most famously defeated British forces at the Battle of the Thames, where Tecumseh was killed. This battle solidified Harrison’s reputation as a war hero and served as a basis for his support for the Presidency decades later. This entry was posted in Art and tagged Battle of Thames, Confederation, Portrait, Rembrant Peale, Seven Years War, Shawnee, Smallsword, Tecumseh, Tippecanoe, War of 1812, William H. Harrison. Bookmark the permalink.